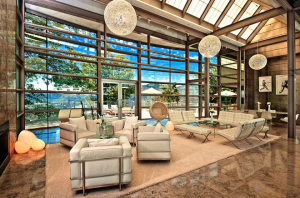 A contemporary-style mansion in Malibu that has been the set of more than 20 movies, television shows, and music videos has returned to the market with a price tag of $8.95 million. The curving glass-and-steel home, at 33583 Mulholland Highway, is set on nearly 17 acres on a private knoll, with the nearest neighbor 400 feet below.The living room faces west, with sunsets over Malibu’s Boney Ridge, a sharp outcropping of rocks in the Los Angeles hills. The master suite faces south, with views of the Pacific Ocean. The house features limestone floors containing fossilized creatures. The property also has its own helipad. Though the architecture, by Ed Niles, is distinctive, the 7,000-square-foot home’s most notable feature may be its Hollywood history. It has appeared in more than 20 pieces of entertainment, serving as the backdrop for Chris Brown’s “Fortune” album cover, Britney Spears’“Work B**ch” music video, and movies from “Face Off” starring Nicolas Cage and John Travolta to “Benchwarmers” starring David Spade, Adam Sandler, John Lovitz, and Rob Schneider.